Jantar Mantar at Jaipur is the largest stone observatory in the World and this feature makes it, a special destination for a traveler. Jantar Mantar of Jaipur is one of the five astronomical observatories built by Maharaja Jai Singh, the founder of Jaipur. During the period between 1727 and 1733, Jantar Mantar took its form and structure. Initially Jantar Mantar was named as Yantra Mantra, which means instruments and formulae, but due to mispronunciation of the term, it is changed to the recognized name. Jantar Mantar has a remarkable collection of architectural astronomical instruments. It portrays noteworthy attempt of the ancestors, who were interested in astronomy and knowledge of celestial bodies. Jantar Mantar is wholly constructed with stone and marble. The observatory has fourteen statistical instruments for measuring time, predicting eclipses and to ascertain other astronomical events. 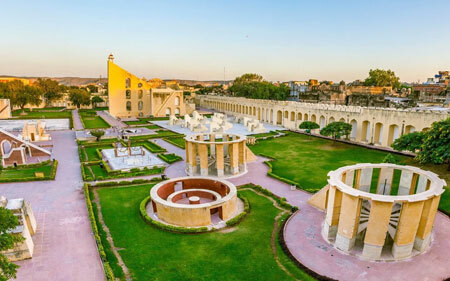 Amongst all the instruments, the Sundial usually attracts the maximum attention of people, which tells the time to an accuracy of about two seconds in local time of Jaipur. Jantar Mantar was carefully renovated in 1901 and was declared a national monument in 1948. Today, Jantar Mantar has become a major tourist attraction in Jaipur.